Most United States travelers begin by flying to Miami, St. Maarten or Puerto Rico on American Airlines or other major carrier. Air France has several flights per week from Miami to Martinique. American Eagle has flights from San Juan, Puerto Rico to Guadeloupe. American Eagle also announced plans to provide nonstop service between San Juan and Martinique every Thursday, Friday, Sunday and Monday beginning December 15, 2005. 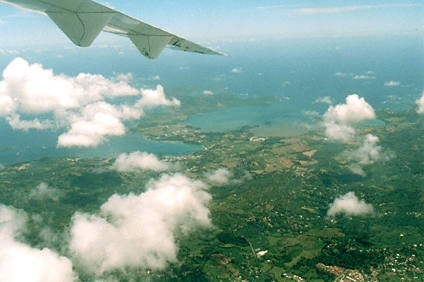 A regional carrier, Air Caraïbes, has flights to Martinique from San Juan, Puerto Rico. Air Antilles Express, offers flights between the islands of St. Martin (Grand Case Espérance Airport), Guadeloupe and Martinique. The beautiful new Lamentin Airport is approximately 6 miles from Fort-de-France and 12 miles from Trois Islets / Pointe du Bout. Please click here for a directory of airline companies. It is possible to travel to Martinique by boat from the nearby islands of Guadeloupe and Dominica. Some ferry lines offer daily service while others provide service on only certain days of the week. Both passenger and passenger/motor vehicle ferries are available. Please click here for a directory of sea transportation companies.